I decided to do things in threes on Saturdays. And today is a “Show and Tell”. I have this set of story dice and sometimes when I’m feeling a bit silly or uninspired, I give them a roll. There are nine dice and I will roll all of them for you but you’ll only choose three for your story inspiration. Hence the name of the game…I will Show you the dice and you will Tell a story. Let yourself have some fun and write anything that pops into your head. Maybe a silly little diddy will spark something new and wonderful. 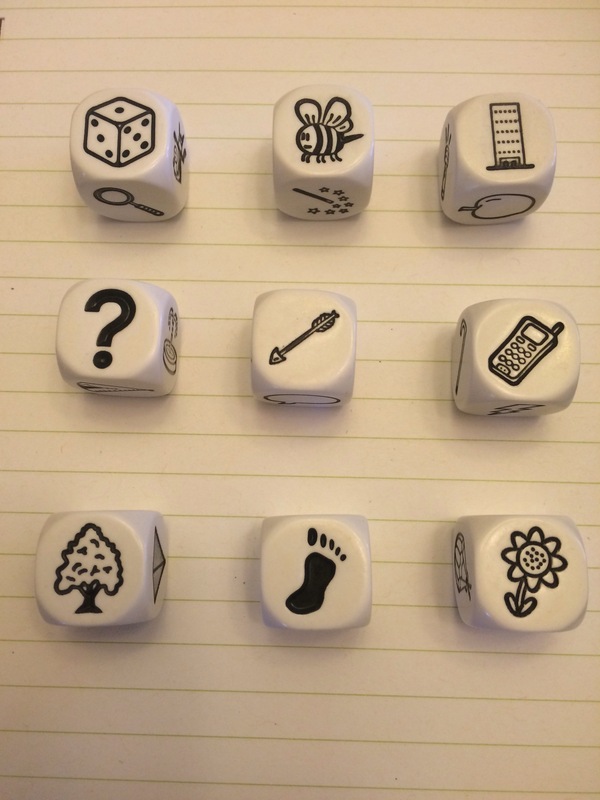 I would love to hear which dice you chose and even your story if you’d like to share in a comment. And as always, may all your days be circus days! The bumbling bee got lost on the way to the budding tree, and now he’s so far from home. His five story hive was a quick jump and jive, but it’s easy to get lost when you roam. Poor little bee set to jumping and jiving, but his hive was not to be seen. Then the budding tree beckoned, with a three story hive and prettiest little bee queen. A barefoot child ran through the halls, his legs were short and the building was tall! But he didn’t mind, he loved to run! And he counted the floors as he passed each one. 1,2,3,4,5! As he ran all around and every which way, he picked up a toy with which to play. A bow and arrow! An amazing find! And look here, windows all in a line! 1,2,3,4,5! As he strung the bow, he thought of a game. Shooting at targets, to practice his aim! But breaking a window is a capital crime, so he opened them all and took his time, counting 1,2,3,4,5! Then he raised the bow and he drew it tight, but he wasn’t prepared for the beam of light that parted the clouds and got in his eyes. This kid was in for a big surprise! In 5,4,3,2,1! At that very moment, a bird flew in! Confused and lost, it began to spin. The little boy gaped and lowered his bow…and shot himself right in the big right toe! 1,2,3,4,OW! Hahaha this is so great! So glad his toe was ok ☺ ️Thank you for sharing!